The Studio 49 1000 series of Orff instruments features a break-through design for its xylophones and metallophones... they are compact, yet richly resonant. The small size makes them very portable and perfect for the teacher working from a cart, or within a small space. 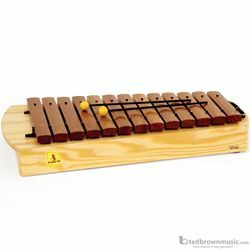 This Studio 49 model SX 1000 Diatonic Soprano Xylophone includes F# and Bb bars (16 bars total) and 1 pair of mallets. Range: c2-a3.